Did you know he worships Satan too?? Dale has a tattoo too, you know what that means..... because I don't, I don't actually think it means anything. Buzz is a pirate. Two earrings in the right side means he has two parrots. Buzz was heavily involved in the Chris Cornell tribute concert. A bit of a shame Patton pulled out and I guess Eddie Vedder did too. Not to mention that Badass Gold Tooth. Which Came first, the earring or the Grill? I guess the Earring, both of these things are cool. I saw Josh Homme with a black tooth, someone said it's platinum...apparently he's always had a thing about teeth in dreams, I have had weird teeth dreams too so I guess it's not unusual. Anyway...Melvins and Foo fighters together, could have been worse, you know? No one invited Courtney or Rob Zombie did they? I hope That Dave and Buzz reconciled maybe or had a dramatic sit down, better than ghosting eachother in the hallway like high school...or maybe it's Just for the best to not think about it. It would bother me, I think it would but I couldn't tell you how I'd feel in either persons shoes..So I'd Just move forward. Is there no more tour dates arranged yet for the year? If not, get on that annual new album, new tour updates guys! so......you'd go see them this year? Of course not. I'd just like to hear what's going on/planned in Melvins land. A new tour - as much as it doesn't overly interest me in and of itself - means a new record!! I do however like checking out their setlists though and watching the occasional video. Another bonus of Melvins on tour is more Melvins interviews get uploaded. 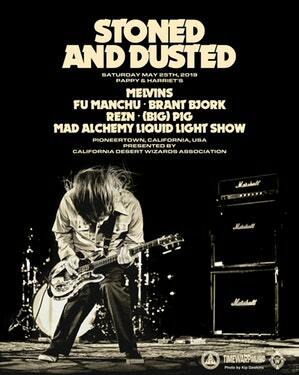 Turns out that May gig is part of Stoned and Dusted fest. The rest of the fest is held in a secret desert location! I'm betting pinkus gets stoned at that festival. It will be an outdoor show at Pappy & Harriets which would be amazing.